The other side of the true religion equation is caring for widows. In the months leading to my widowed mother’s death last July she longed to be free of her dementia ravaged brain and the bizarre world she crept through each day. When she died, I thought I’d feel peace, for the end to her torture, and for me, relieved of the day and night weight of trying to ease her pain, brighten her life, lift her load, with rare success. Instead, I miss her wacky presence. I miss having a Mom, even if I’d been the one mothering her for years. Instead of taking care of a widow, I am an orphan. And I have become extremely sensitive to the multigenerational relationships around me. I notice the middle-aged woman easing her father out of her car to the wheel chair—often a great challenge in itself—and chatting with him about what he “needs” to buy in the grocery store. I want to hug her and encourage her to keep on. Often the nights as well, if you have your loved one at home, or just can’t sleep because they are on your heart and mind. I know they can be exasperating, exhausting, argumentative and unappreciative. I know sometimes you are so bone tired you don’t know how much longer you can do this. At times you don’t even want to see your “loved one.” And you feel guilty. Somewhere you know, probably unprocessed, they are not your enemy. It is the ravages of dementia you both battle. And in the midst of it all, you are grieving. As they lose abilities and you take on more responsibilities, you know this is slow.motion.dying. It rips you up inside. Let go of who they were. If there is anything at all that they enjoy or respond to now, go for it, in spades. If I had a do-over I’d give my mother more baths, more back rubs and loads of ice cream, because that’s what really brought a smile to her face, until near the end. If your once unsmiling, go-by-the-rules mother is all of the sudden giggling at all the wrong moments, giggle with her. It hurts to see your once proud, successful father muttering in a wheelchair or wearing diapers, but he still needs a kiss on that wrinkled cheek. He needs you, not just folks paid to care for his needs. If she wants to dance in church, go early and dance with her. Don’t worry so much about their falling down or getting lost. This is strange coming from one who used to teach American Red Cross classes to seniors about safety, but at this point in their lives, I believe connecting is more important than safety. Seek every opportunity to relate to whomever you have before you, today. I believe that even with those who seem to be disconnected, deep inside, your loved one is still there waiting for you to reach in when they can’t reach out. Needing so much the security that only connection with you can give them in the nightmare inside their head. Find music from their childhood or youth and play or sing it. Sometimes a song can “wake” a person who hasn’t responded in months. I sang in a nursing home to a semicircle of wheel-chaired patients, one in the back slumped over, oblivious. When we started singing an old gospel chorus, she sat up in her chair and clearly sang every word with us. We learned later she hadn’t talked or responded to anyone in months. So cry when grief hits your gut, then wipe your tears and dance, hug, rub backs, and sing. And hold them and pray, out loud, because their spirit is still alive, hungry for eternal words when the words of this world no longer have value. I have a lump in my throat and my eyes are all blurred. But thank you for sharing this beautiful essence of the shadow land. …. like a bike loosing training wheels, you have soared down the road and cannot stop… let your pen to paper and heart to beat take a hold of Your Story…. So touched by your words and heart, as always. I understand the depth of this sadness (though likely not in the same way). I cared for both of my paternal grandparents; my Papa had dementia, my Grandmere had Alzheimer’s. I had less time with Papa, as his dementia was brought on my advanced-stage stomach cancer, but I had loads of time with Grandmere. I was terribly sad to see her slowly fade away after Papa’s passing. Within weeks she was using a walker, had lost control of her bowels and didn’t know who many of us were. I’ll never forget the day she stood, waiting for me in her undergarments, ready for me to give her a shower. The shower had been a battle for weeks; she would cry and scream and ask my why I was being so cruel. Until one day, before I turned on the water, I asked her to tell me the story of how she and Papa met. She smiled through that shower and through the following ones…telling me the same story over and over again. Those moments, while she was sick and before her death, are some of the most precious I have. While she didn’t remember me, I remembered her, who she was and everything she had been (and still is) to me. There is always trouble through the traumas of life. But I think we both know that there are joys as well. “While she didn’t remember me, I remembered her” is the essence, isn’t it? We carry who they when they have lost the memories of a lifetime that define them, and that is one reason loved ones are so vital in that shadow land. 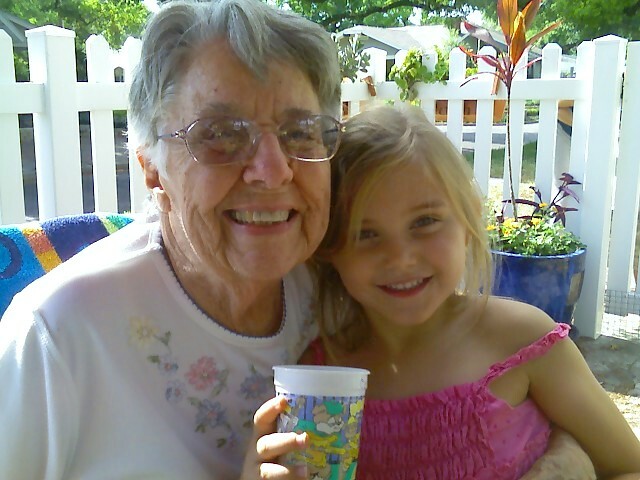 With your heart, I am certain you were a tremendous blessing to Grandmere — a joy in the midst of her turmoil. I read this with tears running down my face. I miss our mom so much. Love you Janie! Me, too. I wrote it with a lot of tears as well. okay you done did it…ya went and made me cry so hard. it’s been since 2005 that my father died of lewy body dementia. no, actually he died of pneumonia. but it was the lb that put him down. it was his death that set me “free”…me, charissa. but oh Jane, I miss him so. he didn’t understand me, openly told me so, and also told me he loved me. he could always get me talking, especially when I had sworn that I would never say anything to anyone again. i am not gonna try to say more, but just that i know hold you in an even more tender spot in my heart than before. get well, recover, and let that spirit find the magic words. plant them, magic beans…I will climb any beanstalk you grow me. So, we are sisters in this peculiar grief. My “baby” sister and I were sure Mom had Lewy body, but never had it officially diagnosed. I think it’s a wackier, more unpredictable ride than Alzheimer’s, at least from what I have experienced with family members and fellow “inmates” with my mother. I love your wishes: “let that spirit find the magic words. plant them, magic beans.” It sparks my imagination and helps fuel the desire to share, even when there is pain (and when it is terrifying to be so exposed). Thank you.